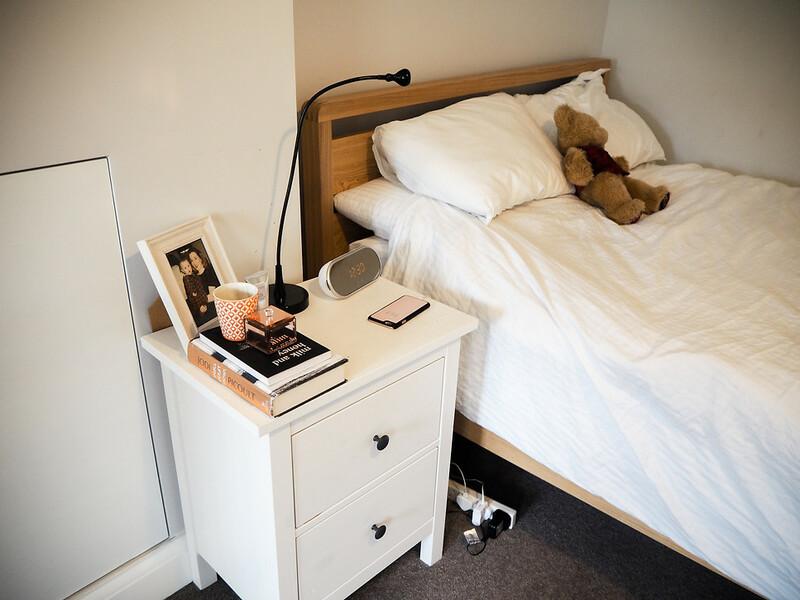 Turning Your Rental Bedroom into a Tranquil Space – Before and After! Often it can be difficult to make a rented property truly feel like home, especially when it’s already furnished to someone else’s taste. I’m lucky in that my bedroom is large and mostly fairly neutral, however it still didn’t feel like ‘me’ so I decided to give it a spruce up last weekend. My focus was on soft, tranquil colours to try and create a homely environment conducive to relaxing at the end of a long day; check the ‘before’ and ‘after’ shots below, all products are linked! One of the first things I did was treat myself to a cushy new duvet that would really fill out my bedsheets; my old feather one was a bit thin and bunched up in all the wrong places, most nights were spent wrestling with it. I bought this Silentnight one which is really well priced and is over-stuffed with hollow fibre so that it stays bouncy and soft all night, plus in 10.5 tog it’s perfect for this weird Winter to Spring weather we’re experiencing! 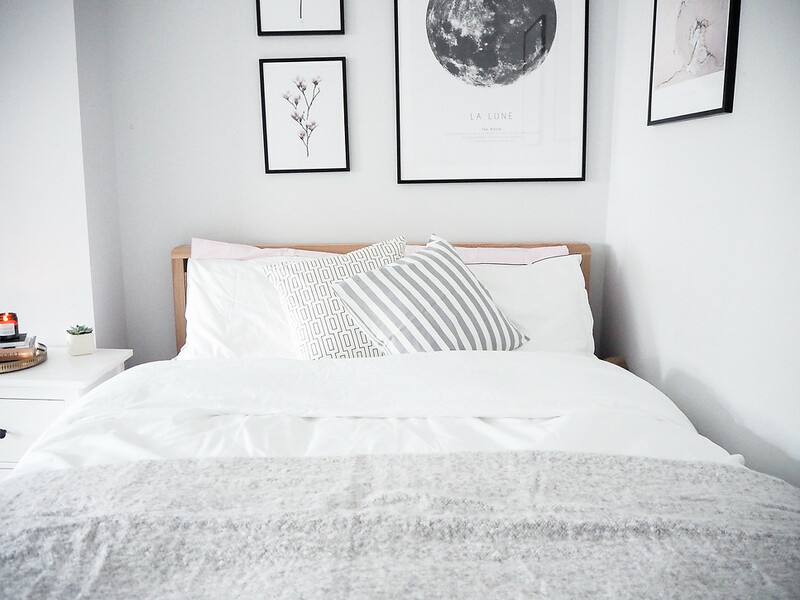 My bedlinen was also looking like it had seen better days and I wanted to make sure that I chose something really crisp and light for Spring, but also soft and luxurious feeling. We spend SO much of our lives snuggled in bed that I think it’s really important to choose high-quality linen that will ultimately allow you to sleep better. The bedding from Draper London is absolutely divine and I honestly spent a good hour just stroking it when I first put it on; it’s a 300 percale weave and is a really worthwhile investment because it just gets better and softer with age and will last you for years. Plus, the French tail means no more of that ugly hang-over going on! I paired the crisp white sheets with blush pink backing pillow cases for a pop of colour and added some texture with this gorgeously soft grey blanket and patterned cushions from H&M, which is now my go-to place for homeware. They’ve got a really good range with lots of on-trend pieces and tones at very reasonable prices meaning you can switch up your colour pallet as the seasons change. When I moved in there were a few pictures up that were not to my taste, so I ended up with really bare walls with the odd nail sticking out or blue tack stain. As you can see in the ‘before‘ photo I had even tried to cover up a frame with a colourful scarf, but it looked very half-hearted, the colours were clashing and all together too bright for a bedroom and overall it just looked a bit crap. Desenio helped me to design and build my own gallery wall and I LOVE it. An afternoon of hammering was rather cathartic and I’m really pleased with the pieces that I chose and the overall look it’s given to my bedroom. When I saw the metal tray from H&M I just had to buy it. 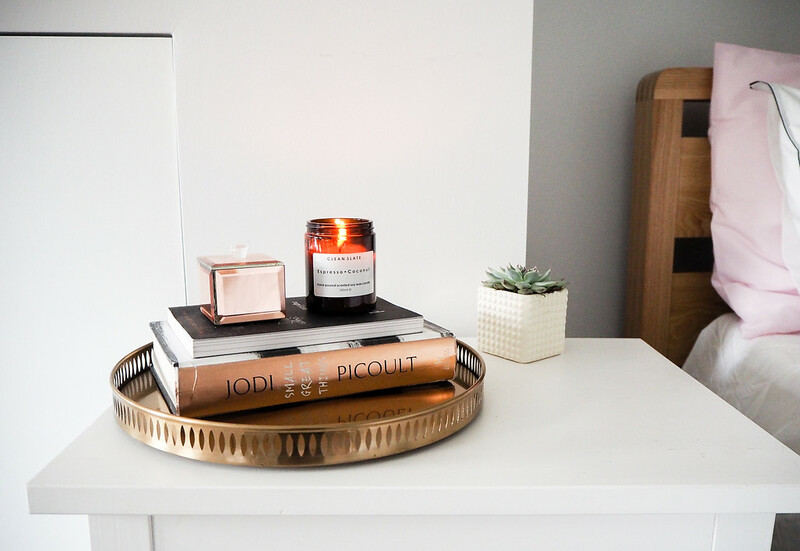 I didn’t really have a purpose for it but it was tooooo pretty to ignore, and it has ended up as the centre piece for my bedside table which I think works perfectly as it stops me using it to ditch all sorts of random bits and instead gives a real focus to the design of the room. The candle is by Clean Slate who are a lovely, lovely Irish independent brand who make the best smelling fragrances ever! Plus, the brown glass jars are gorgeous. The little succulent in a ceramic pot was only £2 in Tesco and so I bought 3! 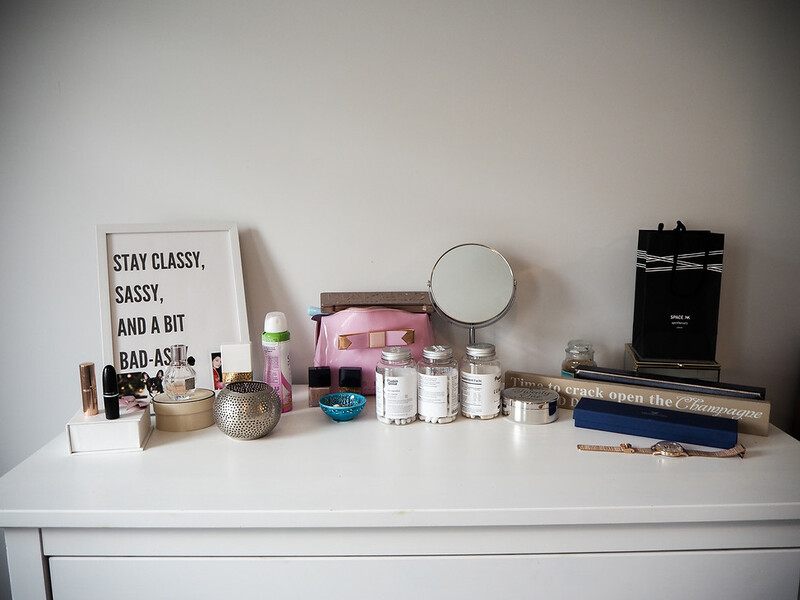 The top of my chest of drawers acted as pretty half-hearted, and often cluttered dressing table. I didn’t even have a mirror so all in all it was basically a dumping group for my make up and perfume. Once again H&M came to the rescue and I scoured their homeware section for cute storage ideas, so much so that I ended up buying a side plate to use for trinkets and I just love it. 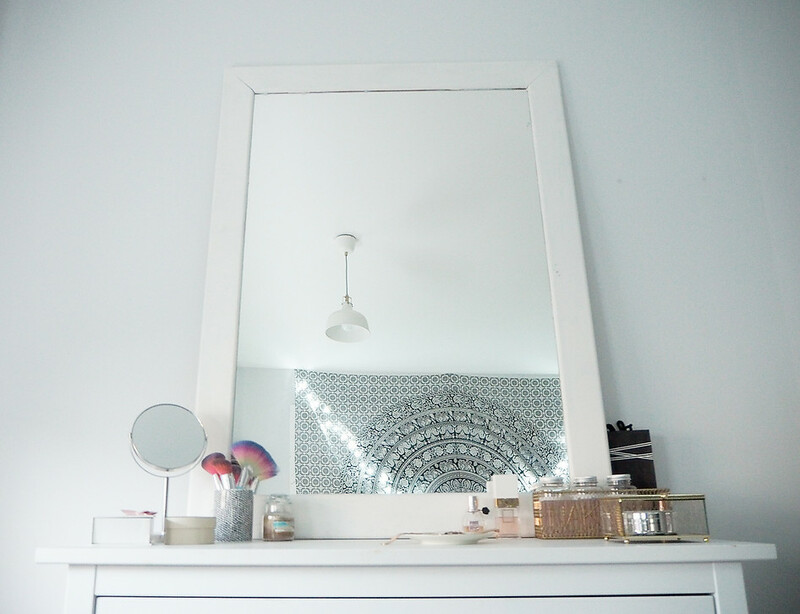 The mirror was an absolute bargain from a local charity shop, and although the walk home was pretty strenuous it was well worth it for £12 and the ability to see what I’m doing when I slap my make up on in the morning! 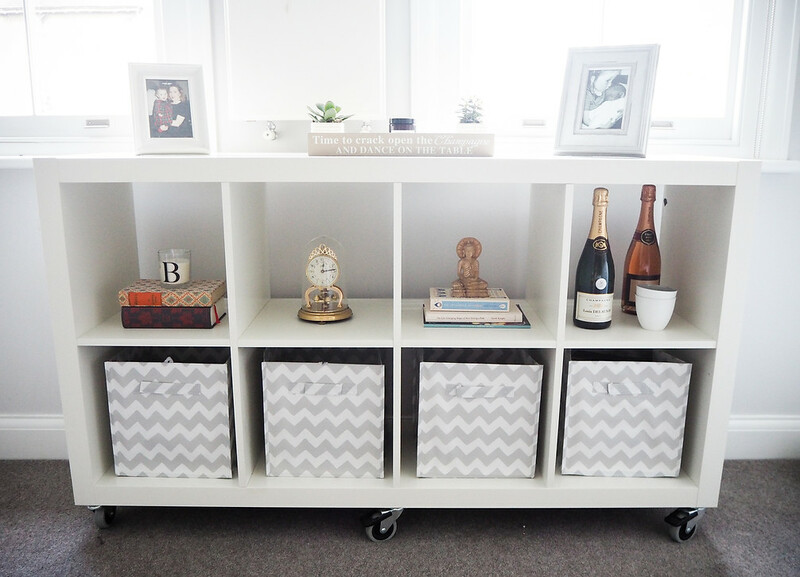 Cube storage is great if you take the time to really plan out what you’re going to keep on it. Otherwise it can just look a bit messy. My mishmash of books and random trinkets was definitely veering toward the latter and so I bought some great little grey and white zig-zag patterned storage boxes from H&M.